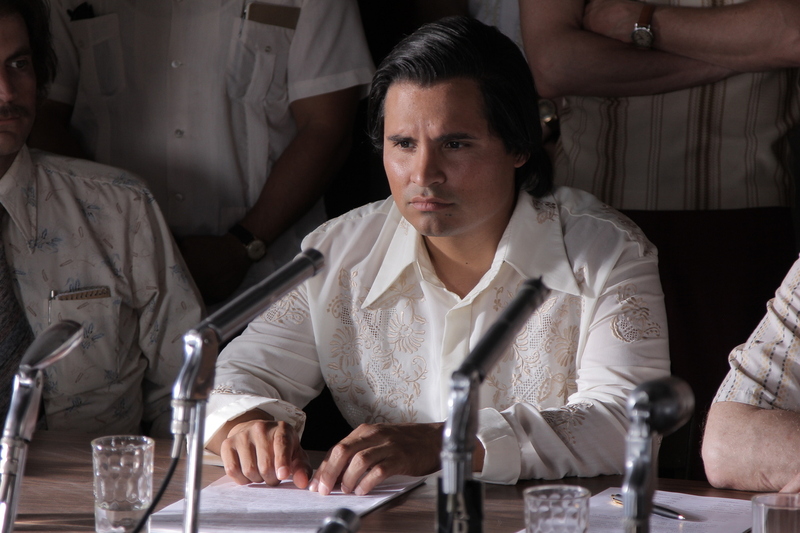 For Actor Michael Peña, A Transformative Role As Cesar Chavez The new film Cesar Chavez tells the story of the civil rights leader who fought to secure a living wage and better working conditions for farm workers. Michael Peña talks about playing the lead role. The new film Cesar Chavez brings to life the famed civil rights leader, who organized farm laborers and fought to secure a living wage and better working conditions in the fields. He founded the United Farm Workers union in California in 1962, and his work inspired millions of people in the U.S. and internationally. Actor Michael Peña, who plays Chavez, spoke with Tell Me More host Michel Martin about how he prepared for the role and what it meant to him and his family. Growing up with two parents that are farm workers — not farmers — the only thing that I knew about him were the streets that were named after him, the schools that were named after him, and a little bit of the story that he worked with farm workers. Me, I'm a Mexican-American, and I don't know about one of the biggest heroes that we have. That gave me, you know, added motivation to tell this guy's story. It didn't surprise me that he was a vegetarian. He actually loved all these vegetables that he was fighting for — fighting for the workers that, you know, picked them. But also, he was a devout Christian. He read a lot about Gandhi. But the thing that really, I guess, surprised me was: here was a guy who was just a strategist, and he was asked to lead the movement because all his ideas were very practical and very good, you know, at the meetings. I don't know about you, but for me, if I got to present any kind of award, I'm shaking in my pants. Oddly enough, I was asked at Comic Con the year before anybody even talked about this movie. They said, "You know if you had a dream role, what would it be?" And it was just a snap answer. I just said, "You know it'd be great to play Cesar Chavez. But I don't know much of his story." Nine months later, I got an email saying that [director] Diego Luna wants to meet about Cesar Chavez. And my first question was, "Is it the pugilist or is it the civil rights activist?" And they said, "It's the civil rights activist." And I said, "Wow that's fantastic." So then I met him. I had to audition three times for it. I was in really good shape after I finished this movie, End of Watch. And when I had the meeting with Diego Luna, he says, "You need to gain like 30 pounds man, please." And I was like, "Uh uh uh of muscle?" — knowing that's not what he's gonna say. And he's like, "No, just of like regular person." And I was like "Aw man!" You know, I did gain the weight, and thank God that I did because you know, this was a man who wasn't prone to violence, and if I looked like a Hollywood actor guy that was like in really good shape, then it doesn't look real and it's not real. And then I actually shaved like a little gap in between my teeth. The way he said "S"s, a lot of the air passed through it. It really informed the way that he spoke. And that was the other thing that I learned. I learned a little bit of organizing. I went to some of the meetings. I actually picked a lot of grapes, you know, just to have a memory of what it's like and what you're actually fighting for, and to see the people that I'm working with. My brother and my father both got laid off around the same that I was starting to do this movie Chavez. And at the same time, it was when all the bailouts were happening. And so it was very similar to these guys that were big business taking advantage of the little guys. And I just wasn't okay with that. And then I heard about these guys giving themselves huge bonuses when in actuality, they were not good at their job. Their statistics were down tremendously enough so that they woudl be bankrupt. And then when they get a bailout, which means that us taxpayers were actually paying for it, they decided to give themselves bonuses. That kind of filled me with resentment towards these people because it affected me directly, which is exactly what I think that's how Chavez felt to these people bullying people who didn't have a voice.